Did you know that October is National Pizza Month? I am super excited by this fact because I love making pizza for dinner. While there’s nothing quite like a delicious extra cheese pizza, I sure do enjoy creating gourmet pizzas at home. 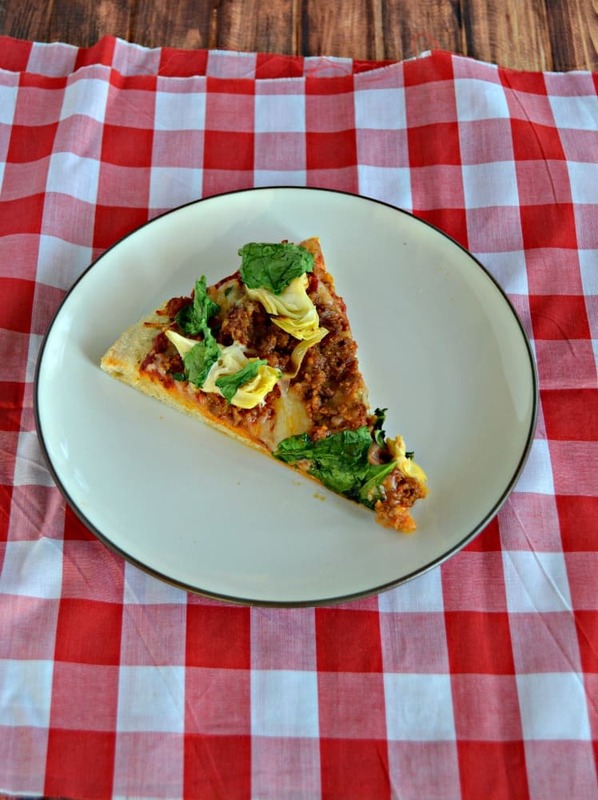 So I was psyched that this week Sunday Supper is sharing pizza recipes! 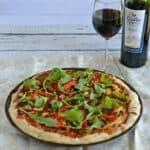 I’ve created quite a few gourmet pizza recipes over the last few years. I tend to a pizza with one meat, several veggies, and cheese. Occasionally I’ll add in a fruit if I think it fits in with the pizza. In this case I went with my old standby of meat and two vegetables. I usually start building my pizza by choosing a meat. In this case I picked spicy chorizo. Since I picked a spicy meat I knew that my vegetables had to be milder and went with the classic combination of spinach and artichokes. Then I settled on regular old mozzarella cheese as I thought that would create the perfect canvas for the other ingredients to pop on. While I often make my pizza dough from scratch I always have a ball of prepared dough in the refrigerator. It’s nice to have in there in case I want to make pizza, breaksticks, or strombolis. It only costs 99 cents at my local store so it’s easy to have on hand. This recipe starts off with the refrigerated dough. I stretched it out and put it on a pan dusted with cornmeal. Then I sprinkled it with Penzey’s Pizza seasoning. If you haven’t tried this you must get it. It’s the perfect combination of seasonings to put on your pizza crust. I let the crust bake for 10 minutes before topping it to give it a good foundation. Once it came out I chose a bold sauce to spread over top of it then layered it with cheese, chorizo, and artichokes. I only put the spinach on top for the last 3 minutes or baking so the spinach would just start wilting but wouldn’t be shriveled up. The result was a pizza that we couldn’t resist! The crust was crispy on the outside but soft and chewy on the inside. 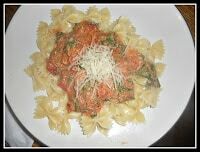 The chorizo added a delicious spice while the spinach and artichokes added their own tasty flavors to the mix. 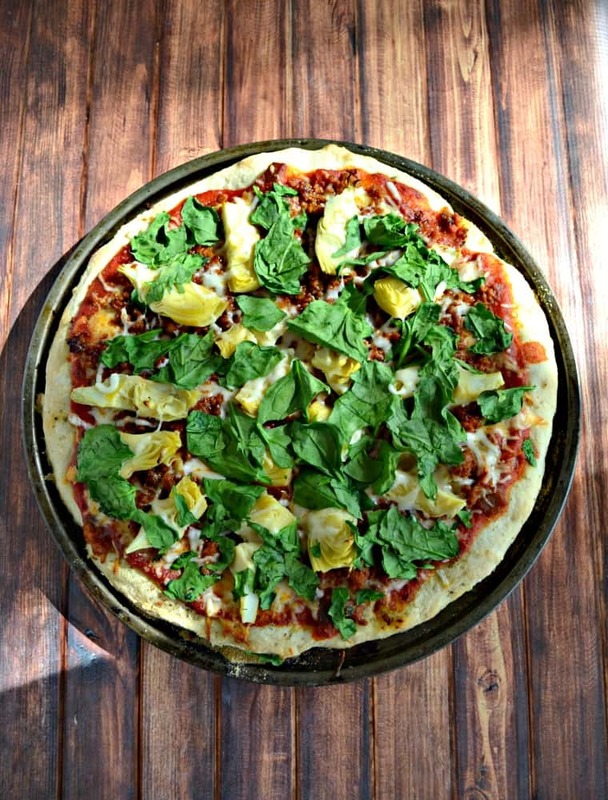 This was an easy pizza to make and we’ll definitely be having this combination again! 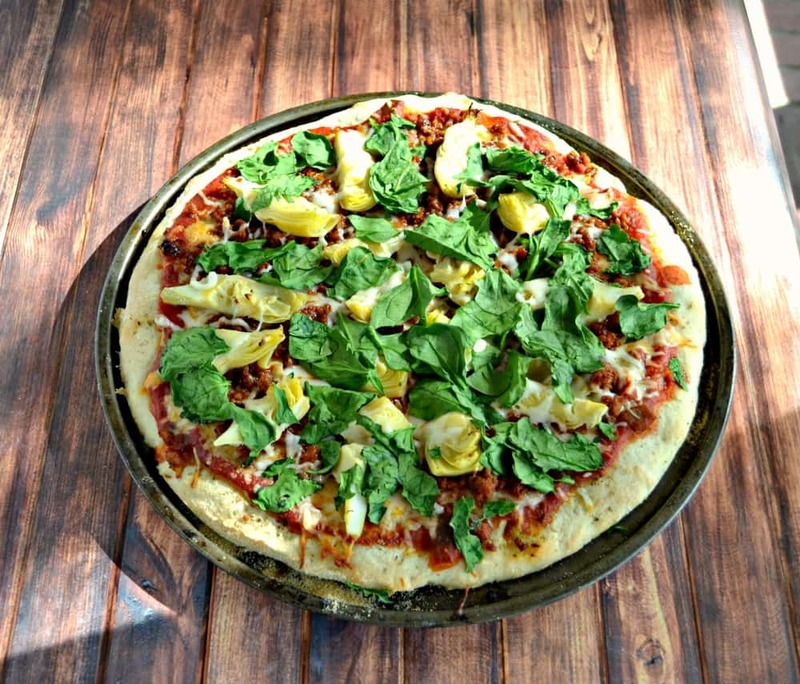 A tasty gourmet pizza topped with spicy chorizo, artichokes, and spinach. Place the chorizo in a medium skillet over medium high heat. Saute for 5 minutes, stirring frequently, until the chorizo is browned and cooked through. Set aside. Stretch the pizza dough to fit inside a pizza pan. Sprinkle the pan with cornmeal and place the dough on the pan. Sprinkle with pizza seasoning. Spread the marinara sauce over the half baked crust and top with the minced garlic. Sprinkle with the mozzarella cheese. 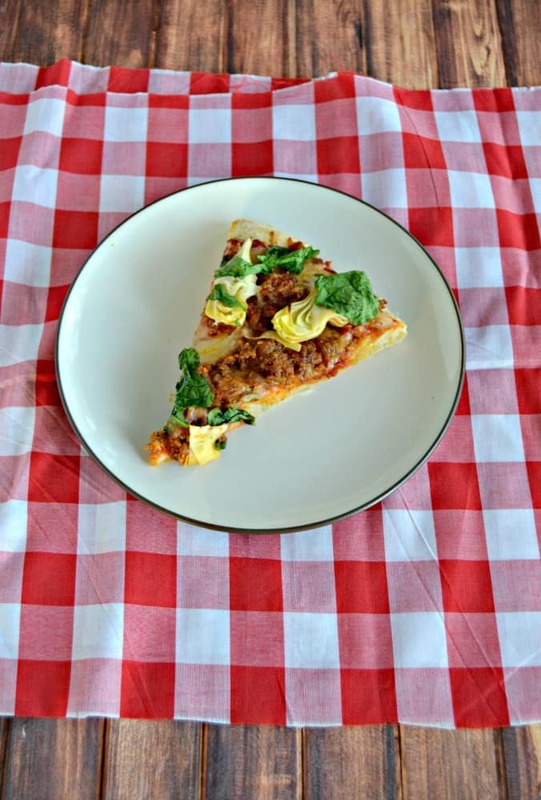 Spread the chorizo and artichoke heart quarters over top of the pizza. Bake for 8 minutes. Remove from the oven and top with the chopped spinach. Bake for an additional 3-4 minutes. Remove from oven, cut into 8 wedges, and enjoy. What a wonderful take on pizza. 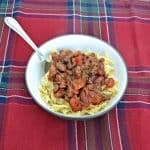 I love how you switched up the meat to chorizo and added artichokes. The artichokes especially aren’t something I think I’ve ever seen on pizza. 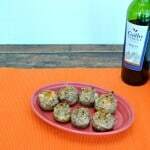 Chorizo is so flavorful! I would have never thought to add it as a topping to pizza. It’s such a great idea. Looking forward to try this pizza! 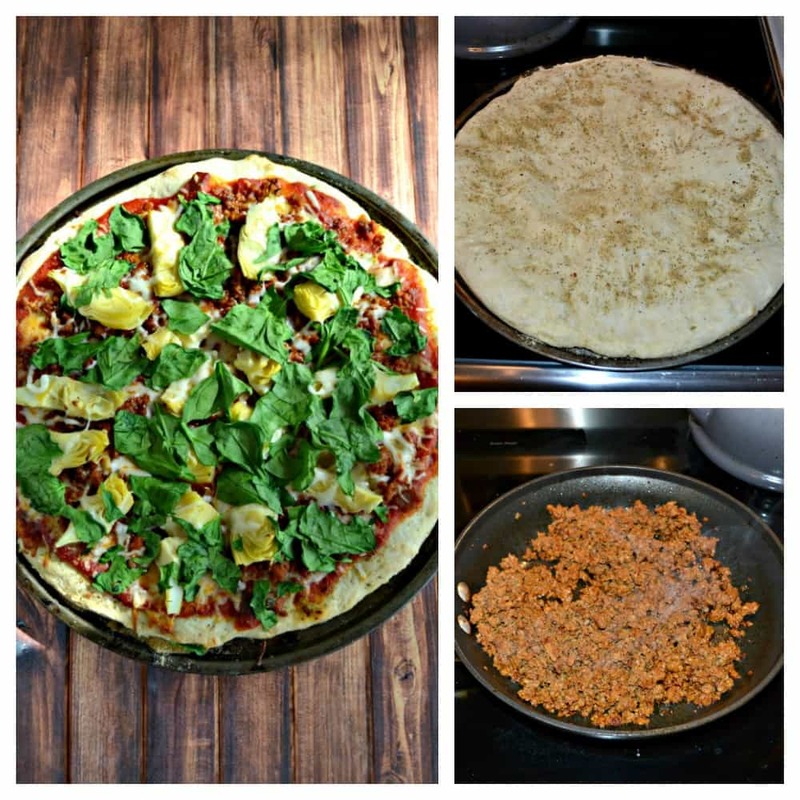 I never would have thought to use chorizo unless I was making a Mexican pizza. I love the flavor profile you chose.